Names of features such as streets change over time. For example, Jefferson Rd is a new official name for the street that was previously called Old Country Rd. Searching for a feature by all of its possible names can increase the success rate of matching. The alternate name table contains the fields for the additional street names. Each record represents one name for a feature. Additional names can be added to the table. The alternate name table must have an ID field that can be used to join the records to the primary feature class. If one feature has multiple names, the Join ID field for the alternate street names of the same feature contains the same value. The primary feature class must have a field that contains a unique ID value for each record. It can be either the object ID or a user ID field that can be used to join the Join ID from the alternate name table. Depending on the address locator style you choose and the type of features you want to search, attributes in the alternate name table are similar to the table of the primary feature class. For a street address, attributes including prefix direction, prefix type, street name, street type, and suffix direction are used for representing the alternate street names. You may have a neighborhood within a city or an official city name versus a commonly used name where either could be used when searching for an address. For example, North Park is a neighborhood within San Diego. Another example may be that a specific ZIP Code might have multiple valid city names; for example, 08648 is the ZIP Code that is valid for Lawrence, NJ; Lawrence Twp, NJ; and Trenton, NJ. Searching for a feature by all of its possible names can increase the success rate of matching. The alternate city name table contains the fields for the additional city names. Each record represents one name for a feature. Additional names can be added to the table. The reference data Role for the alternate city name table in the Create Address Locator tool is called Alternate City Name Table. The alternate city name table must have an ID field that can be used to join the records to the primary feature class. If one feature has multiple names, the Join ID field for the alternate city names of the same feature contains the same value. The primary feature class must have a field that contains a unique ID value for each record. It can be either the object ID or a user ID field, such as city ID or ZIP Code, that can be used to join the Join ID from the alternate city name table. 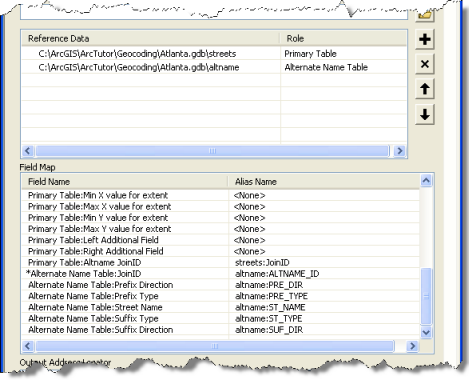 Attributes in the alternate city name table that are similar to the table of the primary feature class are the Join ID and city value. City is used for representing the alternate city names. Creating address locators that use alternate name tables is similar to creating those that do not. There are, however, some additional elements that must be included. By combining these tasks, an address locator can be created that includes alternate names. See Creating an address locator to learn how to create an address locator. The following steps describe how to add alternate tables and specify the fields on the Create Address Locator dialog box. On the Create Address Locator dialog box, click the Browse button next to the Reference Data text box. Browse for the primary feature class. Click the drop-down arrow under the Role column and choose Primary table. Repeat step 1 and browse for the alternate name table. Click the drop-down arrow under the Role column and choose Alternate Name table. Fields in the Field Map section are automatically mapped. If the field map is not complete, select the appropriate field in the table for each field. It is essential to make sure that the Join ID fields for both primary and alternate name tables are selected. In the Alias Name column, click the drop-down arrow for the Primary Table:Altname JoinID field and choose the Join ID field from the primary feature class, for instance, streets:JOINID. Then, click the drop-down arrow for the Alternate Name Table:JoinID field and choose the Join ID field from the alternate name table, such as altname:JOINID. This is the field that contains the Join ID value and is used to refer back to the primary table. Continue the steps for creating the address locator. Using this locator, addresses in either primary or alternate name tables can be searched. For example, searching 100 Jefferson Rd or 100 Old Country Rd returns the same location. Repeat step 1 and browse for the alternate city name table. Click the drop-down arrow under the Role column and choose Alternate City Name table. It is essential to make sure that the Join ID fields for both primary and alternate city name tables are selected. In the Alias Name column, click the drop-down arrow for the Primary Table:City Altname JoinID field and choose the Join ID field from the primary feature class, for instance, streets:JOINID. Then, click the drop-down arrow for the Alternate City Name Table:JoinID field and choose the Join ID field from the alternate city name table, for instance, altcity:ZIP. This is the field that contains the Join ID value and is used to refer back to the primary table. For Dual Range use the left and right alternate city name fields in the alternate city name table. You can also use ZIP Code as the primary Join ID and ZIP Code as the alternate city name Join ID for Dual Range. Using this locator, address and city in either primary or alternate city name tables can be searched. For example, searching 192 Little John Trl NE, Atlanta or 192 Little John Trl NE, Sherwood Forest returns the same location.